On Thursday 15 August 2013 at 7.30pm, Cardinal Timothy Dolan and Bishop Michael Smith will celebrate Mass in St Mary’s Parish, Drogheda to inaugurate the mission of four New York religious sisters who have set up a new convent in Ireland. 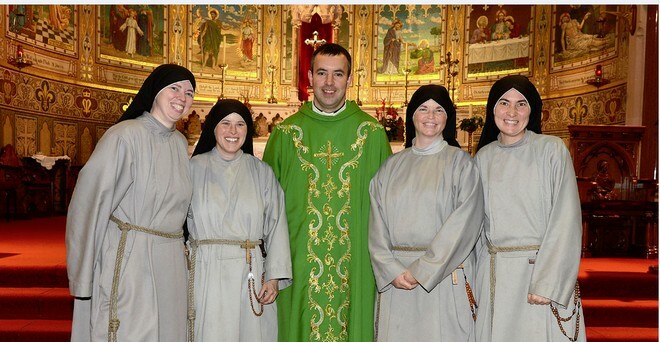 The sisters are Sr Jacinta Pollard, Sr Monica Ward, Sr Veronica Cowan and Sr Kelly Frances. Joining Cardinal Dolan and Bishop Smith will be Bishop Denis Nulty, recently ordained Bishop of Kildare and Leighlin. Bishop Nulty served until last month as Parish Priest of St Mary’s Parish, Drogheda and paved the way for the new convent in Drogheda. This is his first return visit to Drogheda since his ordination in Carlow on 28 July 2013. The Franciscan Sisters of the Renewal were set up in 1988 in New York. The aim of the Community is to live the Gospel values in simplicity according to the ideals of Saint Francis as handed on by the Capuchin tradition. The attached photo, featuring Sr Jacinta Pollard, Sr Monica Ward, Sr Veronica Cowan and Sr Kelly Frances with Drogheda curate Fr Joseph Campbell, was taken recently. Please credit photographer Colin Bell from Pressphotos.ie if reproducing. It is likely that Cardinal Dolan will address the congregation in Drogheda and, if so, his script will be available after the Mass at www.dioceseofmeath.ie. For other photographs after the celebration, contact Fr Robert McCabe 087 9242024.